Javier Sanchez Medina (JSM) Organic Farms in Monterey County is owned and operated by proprietor Javier Zamora who named the farm after his mother. Javier’s father was a farmer, and Javier started farming in Mexico at eleven years old. Javier came to the United States in his twenties, eventually travelling to the Central Coast and deciding to return to farming. Javier worked for a fresh cut flower grower in the area before establishing his own organic farm on two acres in 2012. Since then, he has expanded his operation to 40 acres that are certified organic by California Certified Organic Farmers (CCOF). JSM Organic Farms specializes in strawberries, heirloom tomatoes, summer squash, peppers and cut flowers. JSM Organic Farms has the capacity to grow 300 varieties of flowers including both annuals and perennials. Javier grows South African native plants such as proteas, leucospermum, and safari sunsets as well as flowers like ranunculus, tulips, lilies, lavender, calendula, heather, and boronia. JSM Organic Farms sells its products to farmers’ markets, retail stores, and a couple of wholesalers. When his business expanded, Javier no longer had enough personnel to handle the job of growing the strawberry crown transplants. As an organic grower Javier pays attention to water and soil and is always looking for best ways to manage natural resources. The land Javier leases has a sandy loam soil that easily erodes. Groundwater levels have gone down and pumping and the cost of water is high. Rather than grow strawberry crown transplants himself, Javier began working with local nurseries. To reduce erosion and water use, Javier has been planting Ida Gold mustard between rows. In addition to being edible, the mustard slows the downhill flow of water and prevents it from washing away topsoil. Cover crops along the road and in between furrows help protect areas that are most susceptible to surface runoff. Reduced winter runoff and associated erosion leads to less nutrient loss in the soil. Selecting native grasses with large taproots supports water infiltration and both the mustard and the cover crops improve soil organic matter content and water holding capacity for water conservation. Dry fertilizers such as turkey and chicken manure or bone and blood meal are placed atop the ground to build organic matter. Once the plant develops, Javier will apply any necessary liquid nutrients. To save water Javier uses drip tape irrigation and rarely uses overhead sprinklers. Javier redesigned the shape of his beds to keep soil from eroding and to prevent water loss. Reducing erosion improves water quality and Javier started thinking about water quality and fertilizers. He wasn’t sure what additional nutrients his crops actually required and wanted to quantify exactly how much he was using. The Santa Cruz Resource Conservation District (RCD) worked with JSM Organics to collect soil samples to determine his soil profile and what nutrient adjustments were needed. Soil tests revealed that there was excess nitrogen in the soil, which led Javier to reduce nitrogen inputs and focus on supplementing micronutrients. Javier has found that healthy crowns bought from the nursery require fewer nutrients. As Javier continued to work his land, it became apparent that soil was still eroding in sloped areas. He removed the old irrigation and drainage pipes and excavated a new irrigation pipeline, and now he is losing less soil overall. Another soil erosion project entailed reorienting the reservoir and catch basin so that water flows to the riparian area. Javier planted native riparian plants to stabilize the soil, reduce sedimentation, and attract bees and beneficial insects. Five-thousand gallon water tanks were installed up on the hill which have a pump to enable a gravity-fed system with a capacity to move 280 gallons of water per minute. 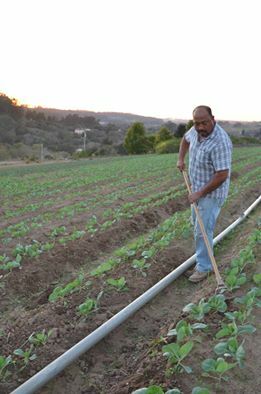 Javier only uses 120 gallons per minute and is watering well within his means to avoid groundwater decline. Introducing habitat has caused a noticeable increase in the presence of beneficial insects and pollinators on the farm. The farm is very diverse with a good balance of native plants and crops to attract predatory insects. Javier has observed that his improvements have made a big difference in improving fruit quality and yields. His nutrient applications have enabled Javier to reduce his reliance on inputs and he is now saving money while maintaining yields.